When the bright red bubble of happiness popped up on my Facebook notifications, I eagerly clicked. Join my event, it urged! Such and such for sale, come over for appetizers and shopping. I immediately clicked “Can’t Go.” It wasn’t because it was sales. Being in business myself, I appreciate these kinds events. I’ve put on these kinds of events. It was the thought of entering a home I’d never been to and mingling with people I didn’t know. Until my classic overthinking kicked in: It would be nice to get out of the house, converse with other moms, and put responsibilities aside for a couple of hours. If nothing else, I could catch up with the few ladies I did know. Maybe I’d even enjoy meeting new people! As I approached the front door, my nerves ramped up. Knock, or just enter? Introduce myself, or start browsing the products? My confidence plummeting, I entered and smiled weakly at a few ladies as I surveyed the room. Walking into the kitchen, I found the hostess and the the sales distributor, a friend. She explained the layout of the products, and my head began to spin. All the ladies surrounded me seemed at ease and thrilled to shop. They were familiar with the products and eager to add to their stash. This was not the picture I had in my head. One friend had come early and left before I got there. The others I knew were rightly engaged in hosting. I knew the small talk starters and other tricks to socializing, but it all made me want to run and hide. I knew how I functioned well, and this was not it. What’s your week look like? I texted. Want to grab coffee? I entered Panera excited to grab some comfort food and catch up with my friend. Her ready smile and warm bear hug set a pleasant, inviting tone for the visit. She asked about my family, recent activities, known challenges, and I did the same for her. We laughed as we caught up on school woes, kids’ antics, and upcoming fun activities, and we brainstormed and sympathized with each other’s stresses and struggles. I left feeling energized and uplifted. Two events, two vastly different experiences… They are not parallel situations, but they confirmed something important for me. I thrive in one on one situations that skip small talk. I know this about myself. There was a time when one on ones triggered anxiety in me too, but never so much as large groups. I should do the hard thing. I should be doing what everyone else is. I should be there to support my friend. Striving for personal growth is a good thing, but focusing too much attention on managing weaknesses keeps us out of the sweet spot of where God calls us to be and can lead to discouragement. He calls us to the freedom that is found in abundant life with Him. Living in that freedom means recognizing who He made us to be and spending most of our energy there. Our unique giftings, interests, and even some of our preferences can point us to our God-sized dreams, and we progress in those dreams when we live in the authenticity of how He made us. What “shoulds” are holding you back? Under what conditions do you thrive? June 2016 initiated a countdown: the last 6 months of my thirties. Though I generally default to anxiety, this milestone was different. Actual anticipation grew as the big day drew near. I was eager to begin this new phase in my life. In early marriage and motherhood, I lived in a strange tension of adult responsibilities but not yet “feeling” like an adult. Teaching kindergarten, owning and cleaning my first home, grocery shopping and cooking for my husband and myself…these were certainly grown-up activities. Then the babies started coming. Hello, adulting. Still, it almost felt like a season of being outside of my own body. I executed all those tasks but still felt so young inside. I soon came to understand that feeling as losing myself, not being comfortable in my own skin, and being unable to discern my unique purpose in life. Yes, I was a wife. Yes, I was a mom. But who was I? Who did God created me to be and do in this life? I was living small, riddled with insecurity and brokenness. I didn’t dare have dreams and hadn’t even imagined such a thing as a God-sized dream. Untangling from shackles like those is slow and sometimes turbulent. 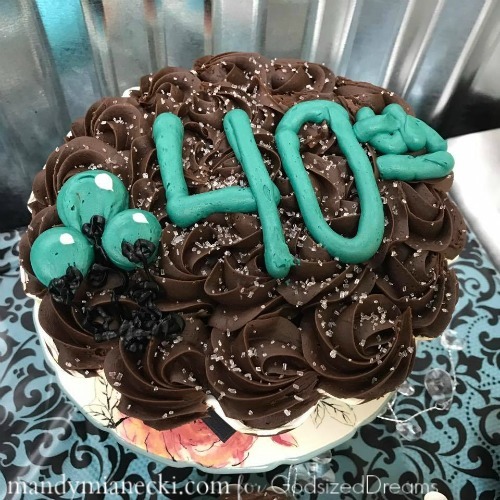 It was a constant search for healing, growth, and renewal that led to the anticipation of my 40th birthday. That yearning, struggling, and reaching expanded slowly into a wide open space of possibilities. Done with drama. Insecurity. Being shackled. Living small. Approaching 40 afforded me with an excellent reason to assess. I reflected on my marriage, my kids, my extended family, my friendships, and my businesses. I pondered what I want the next 10 years of my life to look like. For the first time in a long time, I felt excited, hopeful, and confident. This would be my time to embrace God’s love for me, who He created me to be, and what He’s called me to do. No matter what anyone else thinks or says about it. It was time to walk in freedom. I gathered with some amazing friends, my daughters, added in some painting, wine (for the adults, of course! ), music, cupcakes, and lots of laughs, and ushered in 40 with gusto! Forty marks a turning point for me, a point of readiness. Yet, it’s taken the learning experiences all along the way to bring me to this place of readiness. Maybe you’re on the journey to readiness. Are you anxious? Feeling stuck? Yearning for more? Then I want to encourage you! As long as you don’t want to stay there, you won’t. It doesn’t last forever. You are in a season that teaches you who you are and how God loves you. Maybe you’re right where I am, ready and eager to see where your next God-sized dream takes you. I sense this will be a beautiful season of walking in freedom and long-sought confidence. Enjoy it! You’ll learn even more about who you are and how God loves you. Maybe you’ve been walking in the rhythm of freedom for awhile now. Although you’re still growing and facing struggles, you are confident in who God made you to be and His love for you. Teach us! What do you wish you had known earlier? My guess is that you will continue to learn about who God created you to be and how He loves you. Notice a theme? Wherever you are, celebrate the unique way God made you and the incredible way He loves you. And if you celebrate with a cupcake? Even better! Seven different piles surrounded me on the carpet of my bedroom floor: a small mountain of mismatched socks, fluffy bath towels and wash cloths, never fully clean 5T boys tees and jeans, three separate girls’ stacks, and my own sweaters and leggings. A Casting Crowns playlist wafted from my phone to distract me from my dislike of the never-ending task that is our laundry. Glancing at the next songs on the playlist, I noticed a new one: Good Good Father. Anxiety rose like steam within me, an immediate, visceral reaction to the mere title. My muscles tensed as if I were bracing myself for against an attack. I couldn’t listen to it. Skip. Scroll. Next song, please. I felt like a failure and fraud because the song didn’t instantly evoke an, “Amen! Yes, my God is awesome!” response in me. My mind told me that this is something I should believe, live, and share, but my heart hurt. I was afraid to ask myself if I really believed it. Is God really good? Is he my good father? I wanted to believe he is; yet, what I felt was the weight of the suffering in my life and those of my loved ones. A myriad of questions and decades of distorted notions about the nature of God, suffering, and what he really wants for me gripped my heart. So, I let myself question. I wrestled, and still do, with suffering and the heart of God. Is it God’s plan for us to suffer or live abundantly? Or to live abundantly in the midst of suffering? Does God want our sacrifices and reparations or for us to find joy in each detail of daily walk with him? Does he call some people to extreme suffering or all of us? I know that the existence of suffering doesn’t negate God’s goodness. I know that sin introduced pain and suffering in the world and that God allows it. Free will and all that. I know God redeems suffering. I know good things don’t always feel pleasant. But. I’ve stared in the face of evil and lives devastated, and the wounds are real. When those wounds are soul-deep, and healing is a lifetime process, and truly embracing love is the hardest thing…the words good, good father can feel like a slap. So, I didn’t listen to Good Good Father. Part of me prayed and questioned. Part of me rolled my eyes like a petulant child whenever the song came on the radio. But, I kept asking God to show me who he really is, how he loves, and what he wants for me. I asked him to let me experience his love in ways I never have, ways that exceed my comprehension. I paid attention to people I trusted who talked about God as a good father. However, I didn’t actually believe them…until I heard their story. I needed to know their pain, their wounds, before I could begin to wrap my mind around a good God. I started letting the song play when it came on the radio. I listened to the lyrics. I didn’t embrace it, but I listened. You’re a good, good Father. It’s who you are. It’s who you are. It’s who you are. I knew I was supposed to believe this, but I didn’t embrace it. I am loved by you. It’s who I am. It’s who I am. It’s who I am. This I believed. I’ve spent last several years embracing this bit by bit. But what does it look like for God to love me in my wounds? What does he think of my wounds? I wasn’t sure. 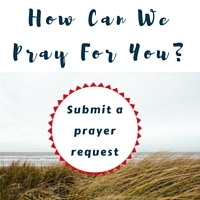 I came across a video by Sarah and Phil Robbins on the power of prayer. Watching it, I experienced a moment when something in me shifted. Though I’d heard the general ideas they shared many times in my life, something in the way they spoke changed something in me. Among other things, they spoke about the nature of God and how they prayed over everything in their lives. They mentioned the song Good Good Father specifically, sharing how they sing it and pray it over their infant son daily. I began intentionally listening to Good, Good Father. (Chris Tomlin version) I started meditating on the lyrics. I even sang them out loud. You’re a good, good father. I don’t understand it completely, but I know these are the basics. God is good. 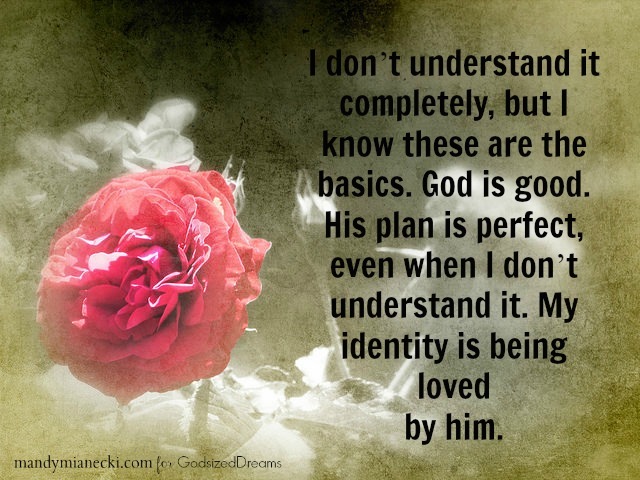 His plan is perfect, even when I don’t understand. My identity is being loved by him. I try to imagine how it looks when I love my children to the best of my ability. How do I think of them? What do I want for them? How I see the payoffs of them enduring through hard things, even when they can’t see it. I think of the people who love me well and what they want for me. I trust them. Then I think of how God loves perfectly, exponentially better than me and the humans I trust. It begins to help me understand a little more. You’re a good, good Father. It’s who you are. It’s who you are. It’s who you are. I am loved by you. It’s who I am. It’s who I am. It’s who I am. As he tends to do, God changed me. I now crave this song. It has become a part of my morning routine to orient me for each day. It often brings tears to my eyes because each time I focus on the lyrics, I am affirming that I believe God is my good father. I believe he is perfect, and who I am…is loved by him. This doesn’t mean life is easy, however. I still have very little “figured out.” For me, it means I am grounded in a firm foundation. It’s putting on my armor each day of this God-sized dreaming journey, prepared as best I can be, for whatever the day holds. It’s where I am. It’s where I am. It’s where I am. 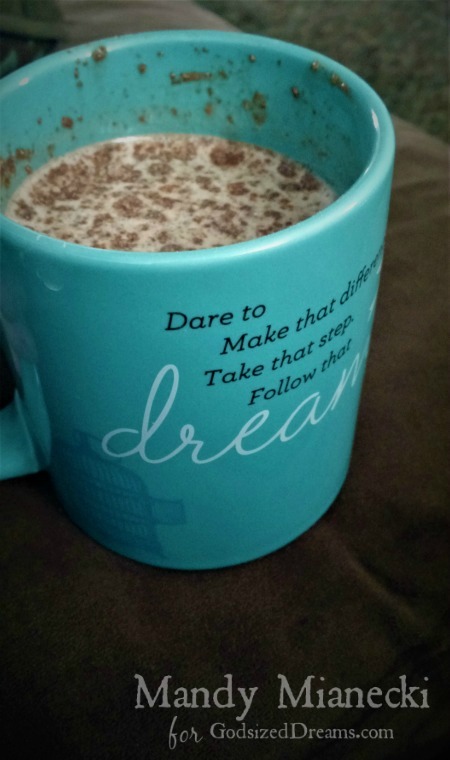 Happy to join @GodsizeDreams for their #DreamTogether linkup! Join me! The peppermint brownies were baked, their aroma wafting through my kitchen. Lemon hummus and citrus water kept them company on the refreshment table. My children were occupied. I was ready. Soon, eager friends and acquaintances would file in to enjoy a couple of hours of fellowship and project time. I invited several women. I had brainstormed a list, gathered my courage to contact them, and even touched base with them a day or two leading up. I was excited for this time and for the possibilities it held for advancing my natural wellness business. Despite my diligence, only two followed through with participating in the event I had carefully planned. Even with a reminder the previous day, one just plain forgot. Others didn’t respond at all to the invitation. That meant taking a loss on the supplies I bought. Immediately, the negative thoughts threatened to take over my mind—and the event. Fears about my ability to work my business loomed over me. And yet, I had two lovely friends in my home. We chatted, we laughed, we made some fun projects that smelled incredible. I caught up with the events in their lives. If it had been just one of them, it would still have been worth it. Yes, disappointment still lingered, but I realized I had a choice: let it get me down, or learn and grow from it. This wasn’t a reflection on me personally. Those who came enjoyed themselves. This was an opportunity to learn new skills about putting on events. There are ups and downs to business. A “down” doesn’t mean failure. I just had to keep going. Giving up because of low turnout was not an option. I had encouraging people surrounding me who would help me going forward. My attitude would make or break my business going forward. Even when we know that the dreams we are pursuing are from God, we will eventually hit roadblocks. There is no dreamer who has a perfect day every day of her journey. We know going in to expect this, to make sure to have a support system in place to weather the tough stages, to set our mind on God’s plan for our dream, and most of all, to stay in tune with the Dream-giver. A challenge on the journey doesn’t mean we’re pursuing the wrong dream. It simply means we need to press in close to hear God’s voice. To have him filter our thoughts and emotions. To point us in the direction in which he wants us to go. 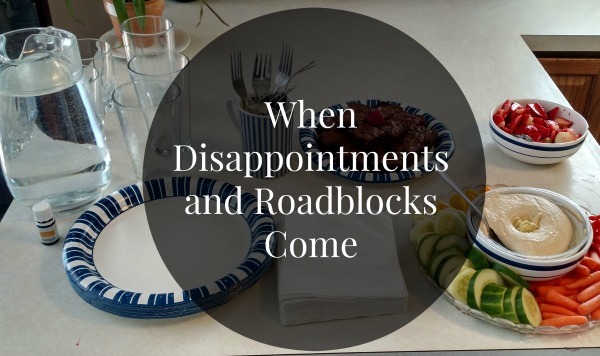 Realistically, those feelings of disappointment at a less than stellar outcome do happen. It’s good and healthy to feel them and then assign them to their proper place and move on. So, whisper a prayer, take a deep breath, and then go! Make that phone call. Book that event. Make that speech. Take that leap. Dream that dream, and then do it! She cups the empty containers in her hands: a hot chocolate tin, a glass jar once home to bath salts, and a salsa jar. She’s envisioning Duck Tape treasures. Probably a craft sale extravaganza too. She sets them down amidst a stash of purses, flowers, headbands, and bracelets…a Duck Tape bonanza. “What can I make from this?” is a FAQ for this twelve year old. She transforms jars. Covers folders. Repurposes milk cartons. Creativity oozes from her, a trait I’m eager to see translate into her adult life. “I’m going to be an art teacher when I grow up. Or an architect who builds her buildings,” her sister says. And I see it…as she follows her dad around asking, “Can I help you put it together, Dad?” Whether it’s a cabinet, bookshelf, or home repair, she’ll do it. How the pieces fit together makes sense to her. She’ll draw it on paper or put it together in 3D. Whatever her future holds, it will be hands on. “It’s okay, Sweetie,” sister #2 consoles her toddler brother. She gently wraps her arms around him and squeezes. She’s perfected the combination of snorts and facial contortions that will elicit giggles from him. They bound around the house as buddies. He misses her when she’s gone all day at school. She extends her snuggles to me, too. 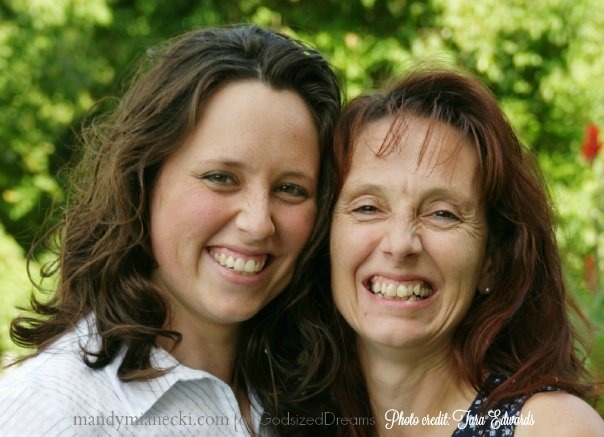 Her most frequent statement reveals her tender nature: I love you, Mom! As for her brother…it’s stack a thing, then knock down. Fill it up, then empty it. Open it, then close it. Press the button. Dump it out. Climb on it. Explore, explore, explore. It’s hard to guess what he’s thinking at three years old, but it’s clear that curiosity drives him. My bet is that his chosen occupation will either be engineer or demolitionist. I won’t lie. These endearing interests and talents include their downsides…mostly messes. But, it’s worth it to witness their God-given personalities shine through. They’re driven to pursue their own interests, and they know what they’re good at. Letting them explore those gifts and interests gives both of us hints at what God might have in store for their futures. Letting kids explore their gifts and interests gives us hints at God’s plan for their futures. It’s the starting point for their dreams. As much as I reasonably can, I encourage their giftings. “What do you think you’d like to do when you grow up?” is my FAQ to them. I smile when my seven year old answers with “waitress,” knowing she simply enjoys eating at restaurants and serving others. Their dreams begin with learning who God made them to be. 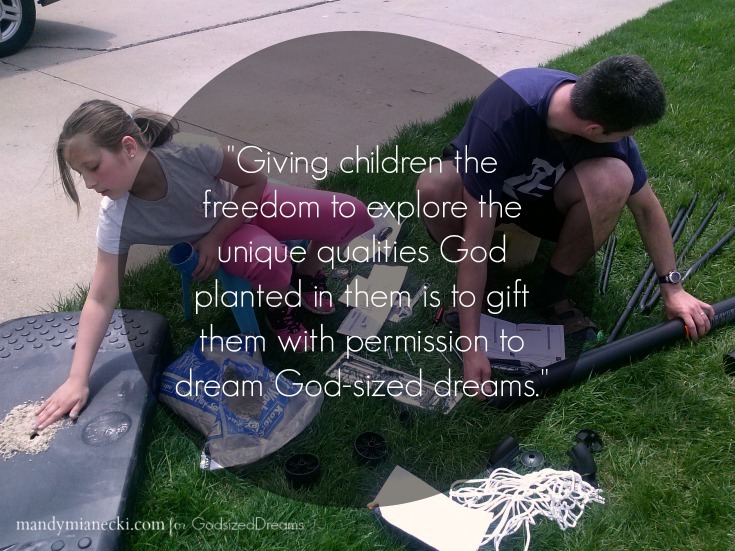 Giving children the freedom to explore the unique qualities God planted in them is to gift them with permission to dream God-sized dreams. Gift your children with permission to dream God-sized dreams. What unique qualities do you see in your children? 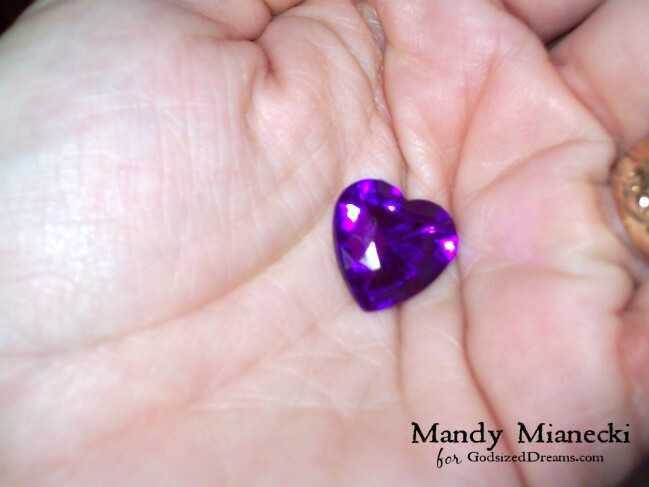 How do you encourage them to dream? I hadn’t. I looked at my baby number four, my boy, crawling around the gated-in living room, weeks away from his first birthday. Keeping his monkey-self alive amidst the blur of being a homeschooling mom qualified as my main accomplishment. And it exhausted me. How would I find time for the luxury of reading a whole book? Mom had other plans. She ordered two copies, so how could I not at least take a peek? You all know Ann Voskamp, right? One Thousand Gifts? So, yes. Mother knows best. If you haven’t read it, run to your nearest bookstore, or Amazon. I won’t spoil it, but suffice it to say that the desire to record my own 1000 gifts was great about halfway through the book. Counting slowed my pace and encouraged me to really see the world around me. 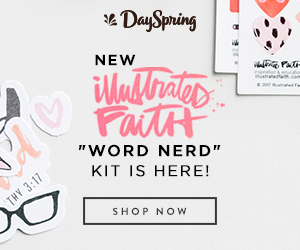 Even more, I was eager to identify the things, large and small, that delighted me each day—God’s little (and sometimes big!) love notes to me. It was a path to joy, and it opened my spirit to a much more abundant way of living—a way necessary for this dreamer-girl. Why? Because scarcity thrives on the lie that there is a limited amount of any given thing. Ever wonder if you should quit because someone else is doing what you want to do? 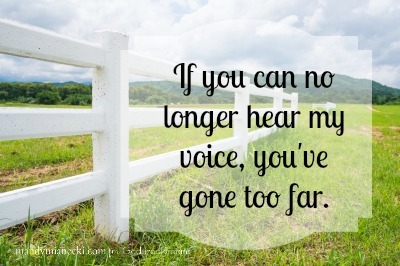 Question whether there is room for your voice? 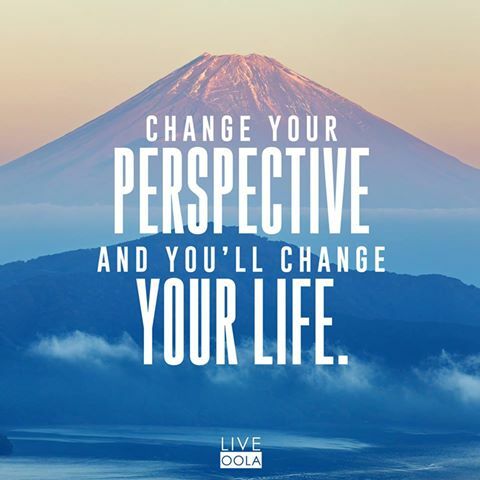 Assume there is no way to get to where you want to be? The truth is that there are dreams enough for everyone. There is no need to compare and evaluate your own against anyone else’s. On the other hand, an abundance mindset, fueled by gratitude, provides a sense of security in your own dream and enables you to come alongside others to help them thrive in theirs. It turns your attention outward to be a gift to other dreamers. 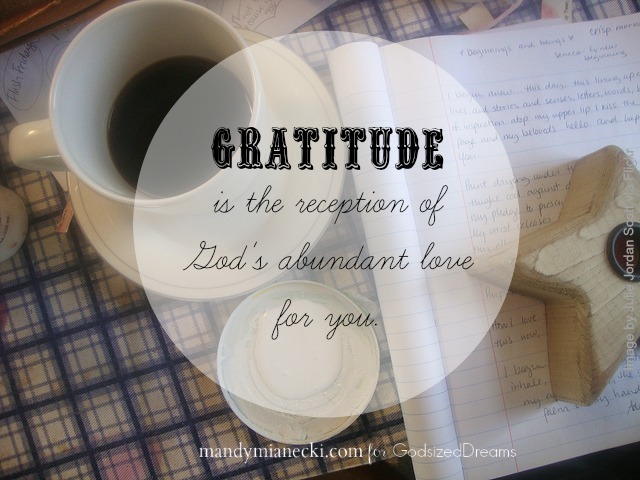 A God-sized dream is more of what God has for you, and gratitude is the reception of His abundant love for you. (<====Click to tweet.) His love makes whatever He has planned possible, tailored just for you. So take heart, dreamers. Your dreams are secure because His love never ends. Are you ready for the abundance He’ll bring to the adventures you’ll have together?